Choose from hammered white card or lined cream card, folded, with matching envelopes. Printed on our Italian white hammered card with matching envelopes. Cost includes artwork time, delivery and VAT. Ready to write your guest names on. Printed on our Italian cream lined luxury card with matching envelopes. Cost includes artwork time, delivery and VAT. Ready to write your guest names on. We can send you a free sample pack, each containing an example on white and on cream to help you decide. Please use the form below. Please get in touch with us using the form below. We’ll confirm costs and tell you how to prepare base content so we can craft your story. 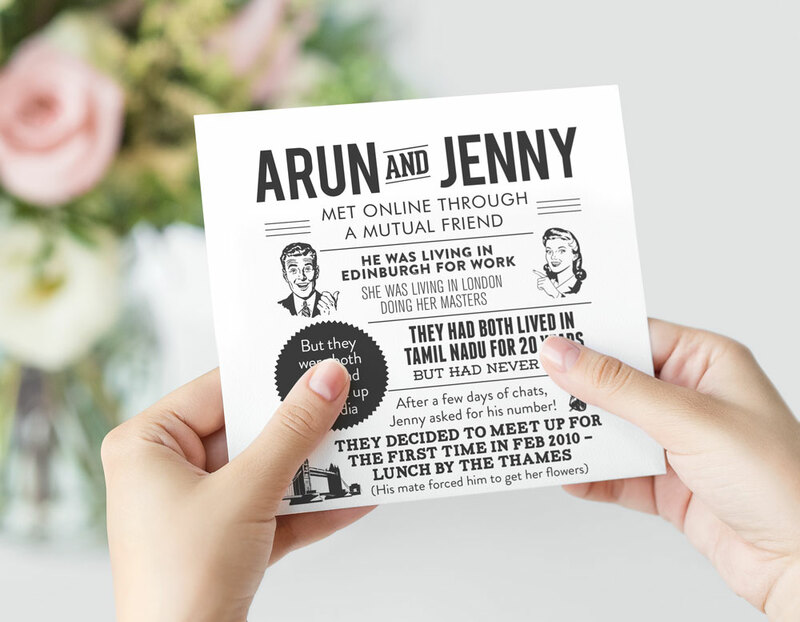 Once designed and approved by you, we’ll take payment and send to print, and you’ll receive your invitations with 7 working days. How long does it take to produce the invitations? Once you’ve supplied your base content, we’ll create a proof for you to approve within a week. There’s normally a few rounds of tweaking, and then we need a week to print a deliver. On average, the whole process usually takes around three weeks. I'm not in the UK - can I still get a story invitation? Potentially yes, please get in touch and let us know where you are – we often create artwork only for couples around the world. Can I have artwork only? I can source my own print. Yes, if you prefer artwork only, we’ll supply print ready pdf files with a simple specification If you would prefer to source your own printing. For this we charge a set free of £159.00 to cover our design costs. We often produce two versions for our couples – one for day guests and another for evening, with relevant details of the back of each – we don’t charge extra for this, but simply calculate our costs on the total number needed. A trading style of Amathias Limited.